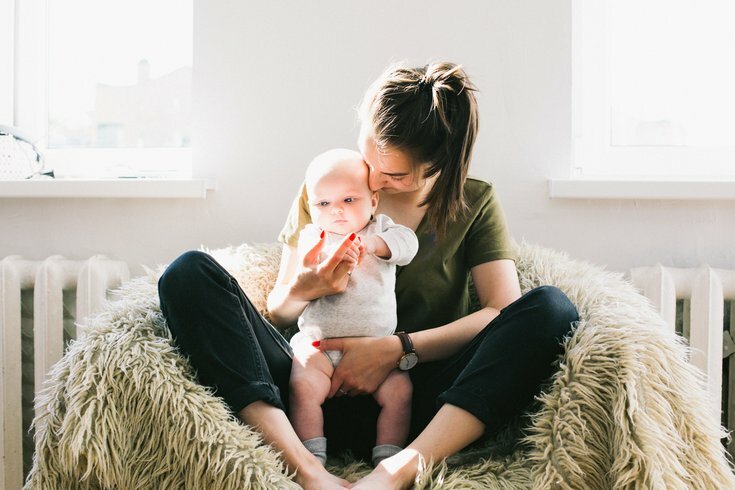 When you bring home a newborn baby, your world gets turned upside down and the daily routines that you took for granted are no longer a given. Meals fall by the wayside as you learn to navigate your new life with this little miracle. It’s hard to eat healthy when you’re constantly worried about keeping a tiny human alive. And, if you’re a breastfeeding mama, eating is even further complicated by the fact that you are responsible for keeping two people nourished. But eating during those first overwhelming weeks with a newborn doesn’t need to be complicated. As long as you keep it simple, you’ll get through the fog of those early days and onto a new routine where (spoiler alert) your new challenge will no longer be that you forget to eat, but that you’re eating your child’s meal and your own. If I were a nutritionist, I would tell you not to skip meals. However, having survived the trenches of new parenthood, I will tell you that skipping meals happens. And when it does, snacks are your new best friend. Stock up on healthy snacks that you can eat quickly, or with one hand. Low-fat string cheese, carrots and hummus, nuts, whole-grain crackers with peanut butter, and Greek yogurt with fruit are all great snacks that require zero effort on your part. It’s okay if you can’t commit to three square meals a day, just make sure you are eating something regularly. This is especially important for breastfeeding mothers since the body requires energy to produce breast milk. Many people underestimate the importance of drinking water because, well, it’s not very exciting. Drinking water seems easy enough yet few people (especially new parents) get the recommended eight to twelve glasses a day, which can lead to weakness and exhaustion. Water is a key factor in almost every bodily function, and it fills you up, which can help control your appetite. You’ve probably heard it before, but many times hunger is actually dehydration in disguise. If you get bored with regular water, try seltzer or add some fresh fruit to your water to add some flavor. If you’re nursing your little one, you’ll likely feel extra thirsty, so make sure to carry a water bottle with you at all times. If you are eating on the go, or aren’t sure when you are going to eat next, you want to try and eat high-fiber foods. Fiber-rich foods such as fruits and vegetables, whole grains, and beans and legumes fill you up quickly so you are less tempted to snack on junk food. An added bonus? Fiber also boosts your metabolism. If you’re lucky, you may get well-wishers delivering home-cooked meals in those early days. This is one of those perks of new parenthood that you should gratefully accept for as long as it is offered. When those meals run out however, and you get sick of ordering on GrubHub or Seamless, you need a plan. If you have a meal plan, you are less likely to stress-eat an entire bag of chips for dinner because your baby is screaming non-stop for no apparent reason. Head off bad food choices ahead of time by putting the right foods within reach. Start by jotting down a few quick and easy meal ideas that can be prepared in under 20 minutes. When I was a new mom, one of my easiest go-to dinners was grilled salmon, sautéed kale, and couscous, which takes no more than 15 minutes to make. If you’re an Independence Blue Cross member, you may be covered for six free annual visits with a registered dietitian who can help you come up with a diet that is realistic for your new sleep-deprived lifestyle. Check to see if your plan covers nutrition counseling. To find a participating registered dietitian, primary care provider, or another network provider, Independence Blue Cross members can search our Provider Finder Tool or call 1-800-ASK-BLUE (1-800-275-2583) (TTY: 711). This is an excerpt from an article on IBX Insights.